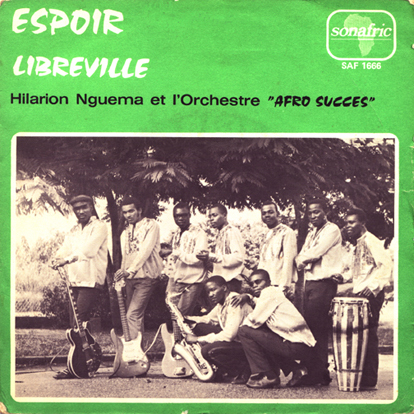 Hilarion Nguema founded L’Orchestre “Afro Succes” in Gabon’s capital of Libreville in 1962. Gabon, or the Gabonese Republic, is a country in west central Africa that gained it’s independence from France on August 17, 1960. A small population (less than two million), abundant natural resources, and foreign private investment have helped make Gabon one of the most prosperous countries in the region, with the highest HDI in Sub-Saharan Africa. But, the musical output is little-known in comparison with neighboring Cameroon and the Democratic Republic of the Congo. The music of Gabon is heavily influenced by the rumba, both the Cuban and Congolese, that was broadcast by Radio Belgian Congo, who formed the first modern orchestra of the country. It was not until the late 1960’s until musicians would take the Afro-Cuban rumba as well as jazz, rhythm ‘n’ blues and combine them with traditional Gabonese elements like “ndjembé” and “bwiti” to define their own sound. I have not been able to find any other information on Hilarion Nguema, except for the fact that he released a handful of albums in the 1980’s and 90’s. If you have any information, please contact me.